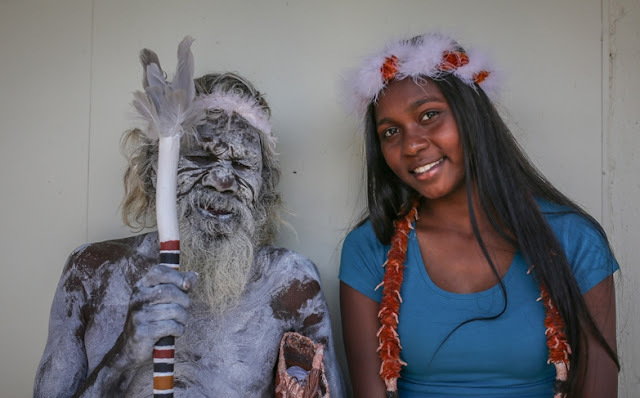 Aboriginal elder Gali Yalkarriwuy Gurruwiwi has travelled from a remote island in north-east Arnhem Land to Victoria, to perform a special dance with his granddaughter. He says "proud" as he touches his heart. His wife Jane Garrutju translates the rest. "It was his dream, to dance with his granddaughters here," she says. He has flown down from remote Galiwin'ku on Elcho Island in north-east Arnhem Land. That's about 3,000 kilometres away from Worawa Aboriginal College in Healesville, north-east of Melbourne, where his granddaughter Sasha has been boarding for the past two and a half years. This is her year 10 graduation. Sasha says she walks proudly in both worlds. She plans to complete year 11 and 12 at Clontarf Aboriginal College in WA and dreams of becoming a nurse, working in her own community and in Melbourne. "I would still love to practice culture and teach people my culture," she says. "I also want to be a role model to younger girls and show them that they can do something with their lives and be happy." Responses to "Proud Aboriginal elder dances with granddaughter at graduation"
Ka mau te wehi ka miharo ahau. I feel privileged to see this old grandfathers expression of pride in his grandchild. Proud moment for the grandfather and grand-daughter. Celebrating achievement.